One of our personal favorites is in Milwaukee’s “Little Italy,” along Brady Street, where we often stop for a visit to Zaffiro’s Pizzeria. History began in 1954 for Zaffiro’s when two nice Italian boys, John and Liberio “Bobby” Zaffiro, created a pizza unlike anyone had ever seen or tasted before. Their pizza has a curiously thin crust – perhaps a mere two credit cards thick – proving even thinner than Caradaro Club’s pizza. To yield this perfection, they begin by par baking their dough, removing it from the oven, flipping it over to dress the pizza, and then returning it to the oven just long enough to finish off the toppings. It is topped with sliced cheese and then ladled with their secret recipe sauce to create a signature Milwaukee style pizza that has consistently been named a favorite among locals and food writers alike. Three local organizations are once again combining forces to showcase the delicious side of the revitalized community of Historic Walker’s Point and South 2nd Street. MKEfoodies, OnMilwaukee.com, and Milwaukee Food & City Tours will host the third annual Walker’s Point Food Crawl on Saturday, May 31, 2014 from 11:00 a.m. – 3:00 p.m.
Tickets are available at: http://walkerspointfoodcrawl2014.bpt.me. Silver Plate admission includes 7 small plates for $50; while Gold Plate admission includes 12 small plates for $75. We’ll be hosting a Bloody Mary promo for guests who arrive between 11 a.m. – 11:30 a.m. for the food crawl. For each admission sold, attendees will be eligible for one free Bloody Mary from Blue Jacket. Bloody Mary tickets must be redeemed before 12:00 p.m. on May 31, 2014. NEW in 2014: Free goodie bags to the first 50 guests who arrive for the food crawl with many great offers and promotions from neighborhood establishments. Plus, each bag will contain a gift card valued between $10 – $100 toward any Milwaukee Food & City Tours outing. Attendees will have the opportunity to stroll through the Historic Walker’s Point neighborhood at their own pace tasting delicious small plates from area restaurants and food venues. Families with children are welcome and encouraged to attend. Participating restaurants and venues currently include Braise, Chez Jacques, Steny’s, c. 1880, Zak’s Cafe, Wayward Kitchen, The Noble, Blue Jacket, Black Sheep, Clock Shadow Creamery, Purple Door Ice Cream, and Milwaukee Brewing Company, and Indulgence Chocolatiers! The fruit will fly on the East Side when the Tomato Romp returns this September. This is Wisconsin’s only tomato festival, and the 1st tomato fight in America. The day includes entertainment and bands on the streets, a Bloody Mary competition and at 4 pm, a tomato fight! Keeping with the theme of celebrating all things tomato, NEW in 2013 is the addition of the TOMATO CHOMP. Attendees will have the opportunity to stroll through the East Side at their own pace tasting tomato-themed plates plates from 9 delicious restaurants including Beans & Barley, Chubby’s, Divino Wine & Dine, G-Daddy’s BBC, Ian’s Pizza, Love Handle, Melthouse Bistro, Schoolyard Bar & Grill and Two Bucks. Vegetarian items will be options; please be sure to indicate that you are a vegetarian during the Check Out process. The weather has turned chilly, and winter is ahead. Are you looking for things to do in Milwaukee for the Christmas season? What are your favorite things to do in Milwaukee for the holidays??? Do you have a young foodie in your life? Through the years, we’ve received many requests to offer a birthday party option for children. We’re thrilled to share that we recently had an opportunity to test the concept with an 11-year old foodie birthday party! Our personal recommendation for which tour to pick for your celebration? We’ve noticed that our Pizza Bus as well as our new Pre-Prohibition Historic Bar Tour are hot sellers for birthday outings, and they are our winter favorites too! 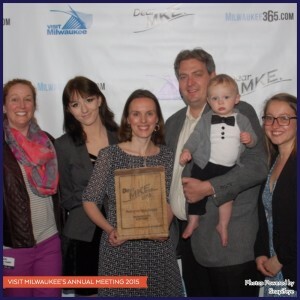 The DearMKE Award honors a locally-celebrated individual or business whose efforts also garner positive national media attention for Milwaukee. Our company does an excellent job promoting Milwaukee not only to locals and visitors, but to national and international media as well. We collaborate with visiting travel writers to expose them to the local food scene with tours led by our knowledgeable guides, who make food, history and fun such a memorable experience in Milwaukee.